I really like the body pillow. It conforms to my body the way I want and I have better night sleep. My only concern is the pillows twist and the material holding them together does seem sturdy but my fear is it will come apart. Aside from that I'm really happy with the purchase and would recommend. 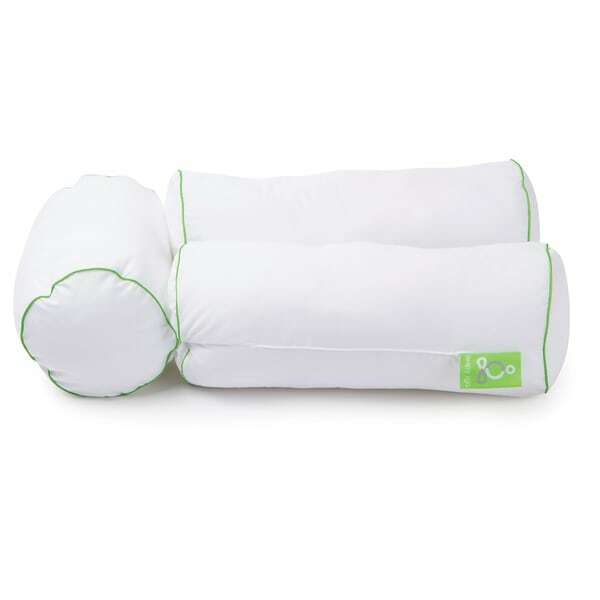 Sleep with supportive comfort using this Sleep Yoga multi-position body pillow. Crafted from 100-percent cotton with a down alternative fill, this hypoallergenic pillow offers a firm and supportive construction with a tri-section design that can be bent and folded to accommodate your sleeping position. Whether your sleeping or sitting up in bed, this durable pillow will provide you with the support you need. This is the perfect item for me. I used to have several separate pillows to support my legs and arms to take pressure off my lower back. Now I just have this! It's great so far, about 2 weeks of use. Still fluffy with enough firmness to support. I'm hoping it will last a long time. Only request is that they make a slightly longer one for us tall people. Could use it just a tad bit longer. But, it is very flexible to use, just need about 6 more inches or so. Maybe in the shorter section? Then "perfection!" Much more versatile than a standard one-piece body pillow, this Sleep Yoga Multi-Position Body Pillow is three connected bolsters. Put the center bolster behind you and use the two end ones to support arms when reading or doing computer work in bed. Also great for side sleeping, where it's large enough that you can rest your head on it and put the end between your knees. I just wish they sold cases for these; you could use a standard body pillowcase but it would diminish the flexibility of the Sleep Yoga pillow. I really enjoy this pillow, it is nice and firm! Very supportive pillow! This has helped me with my knee after surgery. It's the perfect fit between my legs and and helps as a back support. So glad I came across this pillow, way more helpful then any normal regular body pillow. Nice but I'm a little disappointed with the quality of the pillow itself. It's like just cotton stuffing and is a little lumpy. I was considering returning because it wasn't that cheap but I do like the shape and I've found it most comfortable for working on the computer while in bed. Not for me. The pillow was too bulky to use for a side sleeper unfortunately. I liked the concept but it wasn’t able to provide the support I wanted in side sleeping. This pillow is all sorts of Amazing..! I use it between my legs and move snuggling with it! Best choice ever! Has really helped me with a good nights sleep!! "DOES it Come With A PILLOW case, And Is IT WASHABLE? " No, doesn't come with pillow case. Tag says washable, I purchased body pillowcase. Works great. I love mine! Best pillow purchase EVER.